Radiesse FN is a cosmetic filler applied through injection for recontouring and lifting cheeks, smoothing the jawline, lifting the brow, and straightening the nose. The main advantage of this product is the long lasting effects it maintains compared to other fillers. Radiesse FN consists of calcium hydroxylapatite suspended in gel (carboxymethycellulose). Because calcium hydroxylapatite is a normal constituent of bone, in most cases it should not elicit an immune response or allergy. Although it sounds intimidating, calcium hydroxylapatite has been used for prosthetic implants in dental, facial, and orthopedic surgery. The longest term studies come from Italy and suggest that Radiesse FN shows promise as a new agent for facial contouring with no serious side effects and reasonable efficacy and durability. 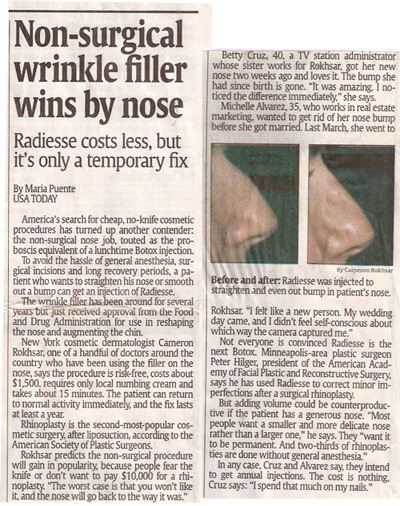 Dr. Alexander Rivkin, Beverly Hills, featured on NBC 4 News for Radiesse as a non-surgical alternative to rhinoplasty.